Ow right an evo 860. I was thinking that sata 860 was some new faster port, like you have sata 3 gbps and sata 6 gbps, thought sata 860 was a new faster standard I was unaware off. Looking for a decent 24/27" monitor with freesync to pair with a RX580 for less than £250. Is this even possible with the price above? Would I be better getting forgoing freesync and getting a decent IPS monitor? It's 29", but ultrawide means the overall height should be closer to 27". I suppose you'd still be able to use it as a normal 16:9 monitor for any game that doesnt support ultrawide. And 2560x1080 is not high enough to give a RX580 too much trouble, unlike say, a 1440p monitor. There is a cheaper and smaller 25" model too, but that doesn't have Freesync. Hi guys. It been around 9 years since my last PC build so I'm looking at making a new one. I've decided to opt for the Ryzen 7 2700x CPU but I'm having more trouble deciding which GPU to go for, currently am leaning between the RTX 2080 and a GTX 1080ti. I wish they weren't the closer side to a grand but that's the side effect of all the crypto mining and NVIDIA having a monopoly. If I want a high-end one I guess I have to fork out. Any thoughts on which to opt for? I currently have a 1080p PC monitor but I'm going to buy a new one in future, undecided between 1440p and 4k at the moment but leaning towards the latter. I am thinking the RTX 2080 might have the edge based on the fact it's not much more expensive than the 1080ti's and it is probably more future-proof based on the connections and new tech in it. Case: Not sure? Open to recommendations. Need one with good air flow. I have a 2700X paired with a 1080ti and am quite pleased with it. One thing, change the RAM to G. Skill F4-3200C14-8GFX. Ryzen seems to like Samsung B-Die modules the best. I went with the H500P Mesh, it's reasonably priced and has good airflow but personally I found it a pain in the arse to build in, so took out the PSU shroud but you'll probably have more patience than I do. Thanks for the info about the RAM, didn't realise how much better some would perform with Ryzen. I'll keep looking into other cases, that one doesn't sound fun to setup lol. Amazon have £50 off of this SSD I was looking at for a Black Friday deal. Seems like an obvious good buy right now even though I might not complete the build until early next year. @Futaba on 4k vs 1440p, if probably go for the latter with high refresh rate. My 3440x1440 screen only goes up to 75hz, kind of wish it was more! Thanks for that link Joe, pretty good arguments there that have made me reconsider. I've been researching different cases today and Im very tempted by the Corsair 780T, despite it not being the cheapest (I want to make myself poor apparently). Anyone have any experience with this case, or the 760T? Any owners of a Vega 56? I'm thinking of picking one up and wondering what averages you get in graphic levels and fps when paired with a Ryzen CPU. Vega seems to be doing well in some of the recent benchmarks I've seen. Can't do any better for £300. So you're the person that buys RGB things. I would if I was a teenager, for sure. @Futaba I wish I had enough money to afford a build with a 2080. I've gone with a Vega 56 but was initially going for an RX 590 but reconsidered because of the ridiculous power draw, which is minimal for the performance advantage it has over a 580. Actually, I think I would have gone for a 1080 instead of a 2080; for the performance I don't think it's worth the price tag. I'd go for a 1440p monitor for the higher framerate and less input lag over a 4K monitor. Saying that, your build has a 2080 so you might be able to push past 60fps on an expensive 4k monitor - if you opted for this I'd be interested to know if your CPU bottlenecks the graphics card if it's the hexa core Ryzen. Thanks, I saved up most of this year for it. I decided to opt for the 2080 over a 1080 ti because the price wasn't massively different (I didn't want to buy second-hand) and the 2080 has some new tech that game developers are just starting to use that will hopefully become more efficient and powerful in future years. I also bought a new monitor for this new build, after using a 1080p Samsung 23" for 6 years I bought a new MSI 2440p 144hz monitor. I got it on Black Friday for £239 which I thought was pretty decent considering most other 144hz 2k monitors were closer to around £500. I went for the Ryzen 2700x CPU so I think it's a good match for the 2080. Just wanted to report that I have got my Oculus Rift working on my Dell XPS13 laptop, connected to the Razer Core V2 eGPU via Thunderbolt 3, with the 1070 from my desktop (now in storage) in it. I don’t think performance is quite as good as it was on my desktop with an i7700k, but I understand I get a big boost if I run an external screen rather than running the graphics back down the thunderbolt cable to the laptop. Just need to get a DisplayPort to HDMI cable to use with my TV. Was completely plug n play (once I actually used one of the two thunderbolt ports), even the nvidia drivers, unexpectedly (I did download geforce experience tho). The only that isn’t working, bizarrely, is the Razer Synapse app, which would allow me to control the lighting scheme for the Core 2 (ie turn it the lights off...). Anyway, pretty chuffed it is working so smoothly! Alows me to just have an ultraportable laptop, but also be able to use a desktop GPU, and have the laptop and GPU on separate upgrade cycles. I found gaming laptops had too many tradeoffs. Only thing I did not like was the price of the Razer eGPU. New 2060 announced, "more powerful" than a 1070Ti for £350.... seems reasonable? Also seems like it comes with Anthem. And in bigger news, NVIDIA are now supporting freesync, albeit only "officially" on 12 monitors so far, but it "might" work on other monitors. I'm still waiting for the new mid-range. £350 is definitely not mid-range. Well, if it's more powerful than the 1070 Ti, that puts it actually quite close to the 2070. I wouldn't consider that mid-range. Indeed. Where is the mid-range now? It's left to AMD it seems. I might pick up the 2060 and stick it in my old rig, which still gets some use. 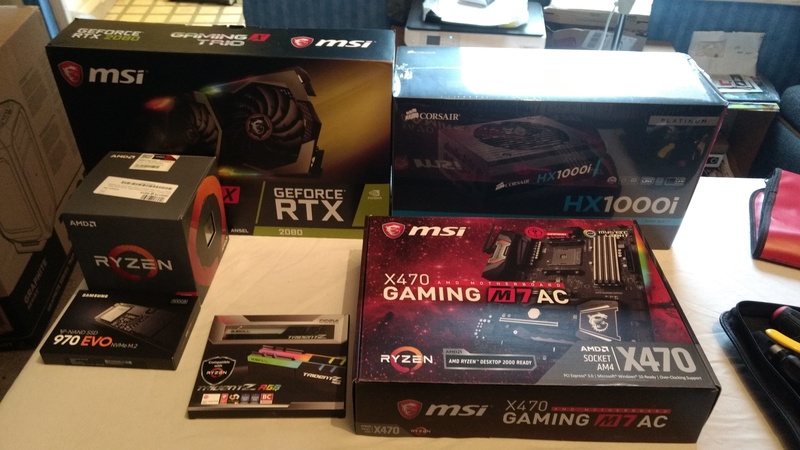 And still I am stuck about which graphics card I want as I don't any expect any AMD competition until second half of the year... 2060 is an option, but for a hundred more you can get a 2070 which might last a year longer with the extra speed boost and RAM... My monitor is only 21:9 2560x1080 so less than 1440P power needed and it is Freesync but not sure how much I care about that if I have a fast enough card. Well, the AMD conference GLU announcement was no help to me with only a higher end Vega II announcement. So now I have to decide if I want a £185 589 (with two decent free games), a £245 590 (with the previous two games plus Division II which I don't really care too much about) for a small increase, or jump to a 2060 (with a free game which I may or may not like ) for an estimated £330-£350 (and no preorders actually makable yet) but the potential 6GB limitation. I am running a 4790K at default 4Ghz clock with 16GB RAM (potential spare 16GB to try from old PC but doubt it is too necessary at the moment) with a 21:9 2560x1080 ultrawide I hope not to upgrade for a few years. Any opinions?